Welcome to Bunny.nu » Blog Archive » What is all this green? What is all this green? We have shown this picture before, but it is so cute that we have to feature it again! The little, little bunlet in the green, green grass. This entry was posted on Saturday, May 2nd, 2009 at 8:43 am	and is filed under Bunnies. You can follow any responses to this entry through the RSS 2.0 feed. You can leave a response, or trackback from your own site. We are finally getting some green grass here now, and the trees are also slightly green. But no cute bunnies in our grass, just the neighbour’s cats! 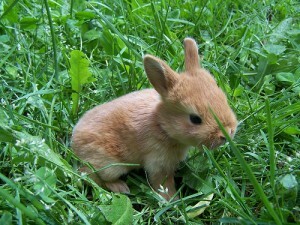 Yes, there is definitely a lack of cute bunnies in our grass! Just as cutesy as before!!! It is greening up at our place too! The speed of green is just amazing here right now. Just a week ago most trees were still without leaves, now many of them seem to be green already. We love green grass.. But we see it in the photos. We’re apartment bunnies. Mom wont allow us to touch the green grass.. How does it feels?? Oh what a cutie!! You can show his/her photo over and over again and we would never get bored of seeing it! So adorable! That little guy looks like he’s really enjoy the grass! This is too cute! A handful of bunlet!